Burrawang was the Aboriginal word for a native palm that once grew abundantly in the area. A land grant of 237 acres had been taken up there in 1856 by early settler John Staggs, but it was not until 1861 that the Robertson Land Act encouraged settlers to make their way up the Jamberoo Mountain to convert the Yarrawa Brush into good grazing land. The Act provided for free selection before survey of unreserved Crown Land in blocks from 40 to 320 acres at £1 an acre. Early selectors in the Burrawang area included Messrs John McGrath, John Hanrahan, William Davis, John Cullen, W.R. Hindmarsh, Thomas Wilson, Edward Moses, John Moore and Peter White, who all registered their selections south of the Wingecarribee Swamp. 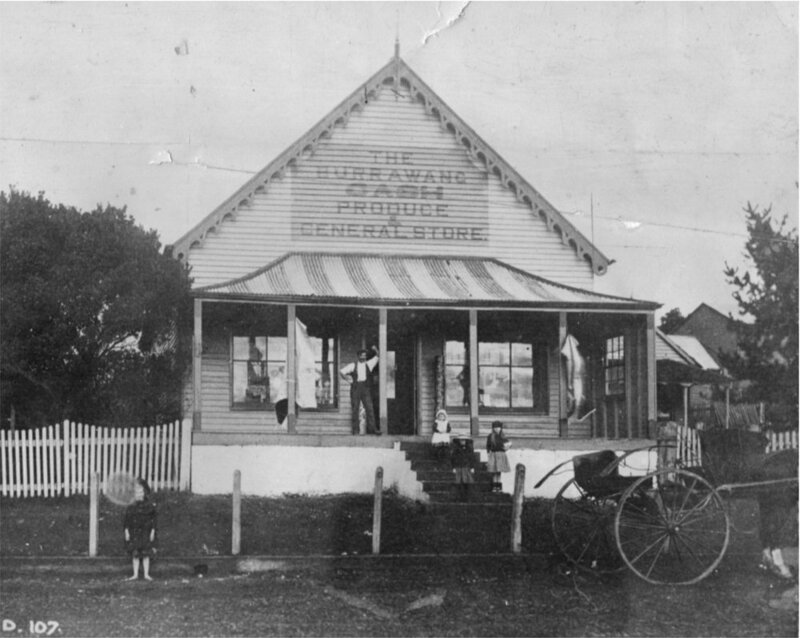 The Burrawang General Store is located on what was originally a 9 1/2 acre lot purchased by Michael John Egan in 1868 from a local land owner John Staggs whose father had purchased approximately 200 acres in the 1850’s. Egan was a publican and storekeeper whose inn, the Prince Alfred was licensed in 1868. There was also a store and post office located within the inn site. In May 1871, Egan sold the 9 1/2 acres to Leonard Dobbin Barrett. At this point, the site was undeveloped. Leonard and his brother, William were the pioneer developers of the village of Burrawang as it was largely located on private land. By July, 1871, the brothers had erected a general store and secured a lucrative postal agency business. The brothers bought a further 40 acres of Staggs land in 1882. In late 1875, William Barrett lobbied for the building of a public school in the vicinity of the store. Over the period, 1875 to 1876, the government agreed to build two schools for the district, Burrawang and Burrawang East. Burrawang Public School opened in January 1878 and is still operating today. In 1883, the Barretts sold a plot of land in Hoddle Street to the English, Scottish and Australian Chartered Bank who then opened a branch. This was the same year as the Odd Fellows Hall was erected on Hoddle St. In 1884, the Barrett’s bought out the proprietor of the Burrawang Herald (commenced in 1883) and they erected a printing office on Hoddle St. The Barretts subdivided their land in June 1884 and was sold from 1886 and named the Township of Burrawang. Fronting Hoddle St, the sale included Lot 1, the Club Hotel, the School of Arts and Barrett Brothers Stores. On Lot 2, was the Post and Telegraph Offices and the General Store site. Lot 2 was sold in 1889 to William Reeves, Burrawang and the Barrett brothers moved to Bowral and opened a General Store there. The store, the cottage and the garden are all now restored and contributing to the long term survival of this charming heritage site.